At Day 1 of Baystate Cyclocross last weekend, the elite women raced for only four laps, with the winner clocking a time of 34:47 (riding roughly 8:12 laps). In years past, this would have been worthy of an eye-roll and nothing more -- a fifth lap would have put the winning time at 43:00, which is marginally closer to the specified race length, (3 minutes long instead of 5 minutes short). However, in 2014 the rules have changed, and in a step toward gender equality the UCI mandated that the women's race should be between 40 and 50 minutes. ...which set off a fairly spirited debate about knowing the rules, why the rules are sometimes bent, and how much sexism is a part of any of this. 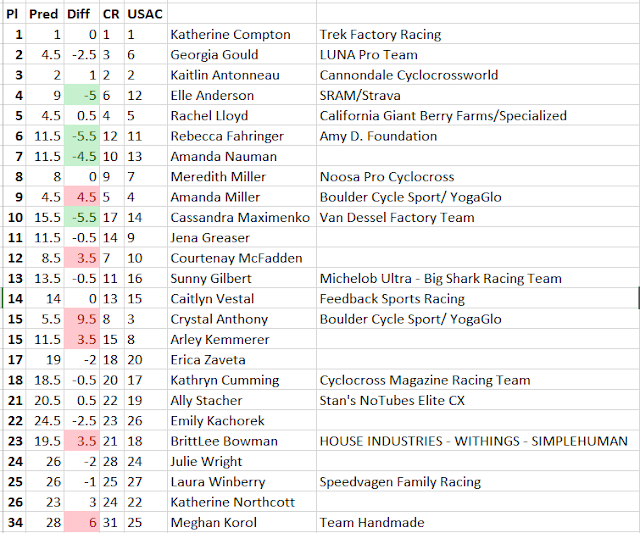 1/4 I asked a question about women’s CX race duration trends the other day and did a little data mining. I think you’ll like what you see! 2/4 This is regarding updated UCI rule 5.1.048 as it pertains to duration of women's US CX races (no less than 40, no more than 50mins). 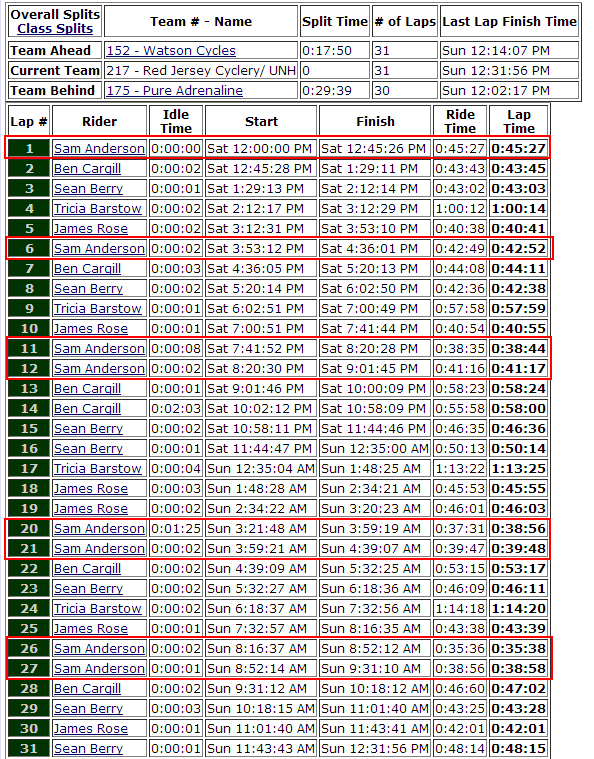 3/4 Of 28 UCI races in US, 4 races were below 40min... 2 >39, 2 <39. By comparison, 2 men's <60 min (but w/in interpretation of UCI rule). 4/4 I did not look prior to 2014, at non-UCI or outside of US. However, for 2014 data suggest that, for the most part, the rule is working. So in 28 women's events, the race was run short 4 times, and 2 of those were by less than 60 seconds. There have been only 2 egregiously short women's races this year (7.1%), and let's face it, getting a new rule correct 93% of the time is basically perfection, right? By comparison, 2 men's under 60 min (but w/in interpretation of UCI rule). Note the rule for men is not 60-70 minutes. It's "as close to 60" as possible. So a 56 minute race is better than a 65 minute race... and yet there's only been two men's races under an hour all season. One would expect this to evenly distributed, ~14 races under an hour, 14 races over an hour, if the officials were following the "as close to 60 as possible" rule. The only conclusion you can draw from 26/28 (93%!) of men's races running long is that the officials, having reframed their mindset to "40+ minutes" for the women, are carrying that over into "60+ minutes" for the men now. So in case you're wondering why you got pulled more often this year, or raced 70 minutes more often this year, that's why. The rule says the duration of the event has to be 40 to 50 minutes. But "duration" isn't defined. It doesn't necessarily mean that the duration is equal to the winner's time. It could just as easily be refering to the time of the last rider on the course. In the case of BSCX day 1 the median time was just a few seconds shy of 40 minutes and the last person on course went 45 minutes. Had they all done an extra lap that last person could have been out there for something like 55 minutes. 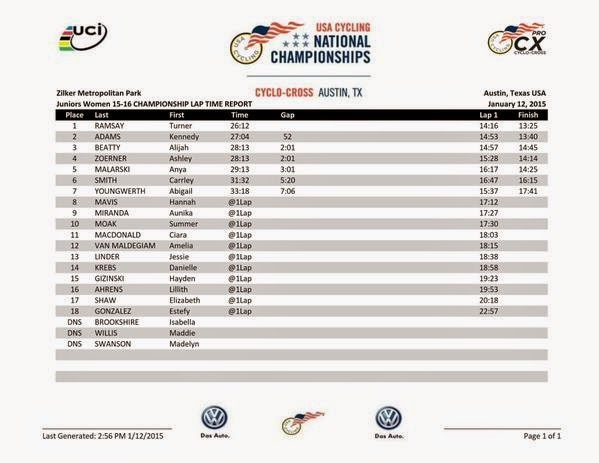 I've been present during the conversation about # of laps at many CX races and I have never ever, not even once, heard any offical say anything about intentionally shorting the women's race. However every once in a while the math does get botched one way of the other. I remember a couple of times where the women's race went a lap long. Paul: your first point is a good one that I hadn't considered. I believe the *intent* of the rule is to have the winners ride for at least 40 minutes, but you're right, it's not specified. My intent here is not to accuse anyone of intentionally shortening/lengthening races, but to show how the women's rule change is also affecting the men's race despite the men's rule not changing from 2013. Hi Colin, interesting data from you and Matt. Thanks. Your observation about the length of men's races is interesting, but I can't see (from the data presented here) why you believe that this constitutes a change from previous years, let alone a change driven by the new duration for women's races. Did the duration of men's UCI races formerly distribute more evenly around the 60-minute mark? Yeah, I guess I have to go dig up that data next! Science is a relentless taskmaster. Thanks for being so energetic in your subservience! Data are interesting. From my racing experience (UCI or cat 3/4), I think women races (criterium, cyclocross) tend to be shorter when the promoters tried to squeeze as many fields as possible in one day or when it is running late (afternoon race). The promoters or officials will not reduce the time of a men or a junior race to get back on the schedule. Another factor is laps that are too long (over 10 minutes) and it could explained for a short race overall.